Hurricane season runs from June 1st through November 30th. The start of each new year is a valuable time to reassess the storm and security protection for your home, business or condo in the Greater Tampa area. Hurricane Shutters Florida stands ready to assist families and businesses in preparation for each upcoming hurricane season with roll-down hurricane shutters. An often overlooked and neglected value of Hurricane Shutters Florida’s roll-down shutters is the ultimate security available against break-ins and theft. 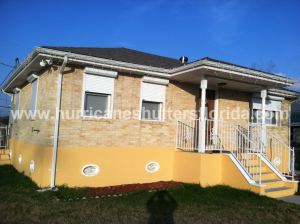 Hurricane Shutters Florida, headquartered in Sunrise, Florida, is one of the largest, most technologically advanced manufacturers of a multitude of options for protecting your home or business including storm panels, accordion shutters, roll-downs, Bahamas, and colonials available. These roll-down shutters are constructed of the finest grade of aluminum for maximum impact resistance and durability. 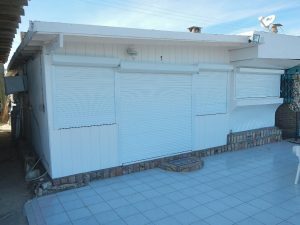 The specially designed roll-down shutters provide maximum strength and insulation from sun, storm, heat, noise and weather extremes PLUS provide security to your property at night or when you’re away from home on vacation against theft. Hurricane Shutters Florida has been providing security and protection throughout the United States and the Caribbean with one of the easiest products available on the market today – Roll-down Hurricane Shutters! Preparation for a pending hurricane or simply closing up your Tampa home or business for security and anti-theft reasons can be utterly exhausting with many of those more traditional steel panels. The simplicity of Roll-down Hurricane Shutters eliminates the challenges and difficulties you would typically find with other storm protection window and door coverings. The Rolling shutter systems come with a smooth, manual crank or can be upgraded to the fully synchronized electric motor drive for maintenance-free operation. Hurricane Shutters Florida produces Roll-down Hurricane Shutters that provide the ultimate security protection during a hurricane for winds up to 180mph and provide the ease of home and business security. Hurricane Shutters Florida’s Roll-down Hurricane Shutters can be made to fit any size window, door, balcony, terrace, or storefront! Our roll-down hurricane shutters have been engineered to meet the most stringent wind codes in the country and have been reviewed and accepted by the most stringent Miami-Dade County product control division, Florida Building Code, and the International Building Code. Your home or business’ bottom line should be peace of mind knowing that your property is protected against break-ins or Mother Nature’s fury of storms! Most importantly, both residential and commercial properties certainly should never overlook the enduring life-time protection against hurricanes and increased security but also the increased market value to your property that the Roll-down Hurricane Shutters can provide! Contact Us Today for a FREE Roll-down Hurricane Shutter Quote! Call us to order today at our South Florida Headquarters: (954) 474-3557.